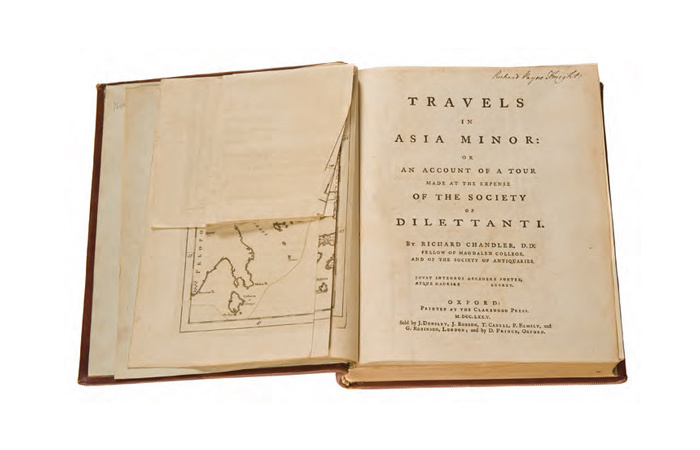 A/ Richard Chandler, Travels in Asia Minor: or an account of a tour made at the expense of Dilettanti. Oxford, Claredon Press, MDCCLXXV , xiv, xiii, , 283,  s.; 1 katlanır harita. B/ Richard Chandler, Travels in Greece: or an account of a tour made at the expense of the society of Dilettanti. Oxford, Claredon Press, MDCCLXXVI , xiv, , viii, 304 s.; 7 planş. İki kitap tek ciltte. Aynı cilt içindedirler.